Across much of the Deep South, quick breads were long a staple of hot meals. Today’s home kitchens often skip them except for special meals. This recipe would be great if you are car-camping, molding the dough into 8–12 cakes and cooking them like English muffins in a skillet on the fire or a camp-stove. This recipe is adapted from Mark Bittman’s How to Cook Everything Vegetarian: Simple Meatless Recipes for Great Food (2007), page 689. Preheat your oven to 375°F, and grease an 8-inch iron skillet (preferred) or square baking pan liberally with olive oil. Optional: add cheese and/or chopped fresh herbs, and/or citrus zest. Or chopped jalapeños (great paired with chili). Or chopped nuts and/or reconstituted dried berries/raisins. Prepare your selection before firing up the food processor, and add them after half the water. Act fast so the dough isn’t overworked. Measure the flour, salt, and baking powder in the food processor, and turn machine on. Stream in the olive oil, then the warm water. It should take about 30 seconds (seriously), and the dough should be barely sticky and have formed a ball. If the dough is too dry add another tablespoon or so of water and re-blend for about 10 seconds. 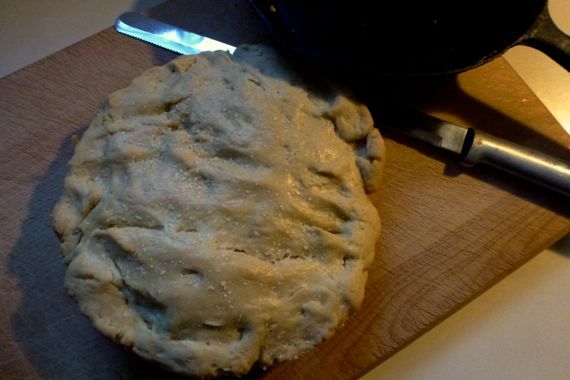 Dump dough into prepared skillet/pan, and spread dough to edges. Then flip the dough (this is why you need excess olive oil in the pan). Cover with foil and bake 20 minutes. Remove foil, sprinkle top with coarse salt, and bake for another approximately 22–25 minutes, removing when top is golden and the bread springs back when touched gently in the middle of the loaf. Cool in pan just a bit, and consume when still warm. Evidence that I need to buy fresh baking powder….